Hi all! Been away for a while but hope to be at least a bit more active going forward. Treasure Trooper and the troopers themselves benefit from doing a lot of offers. 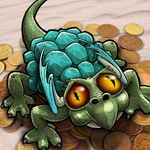 Helps to maintain interest in the dragon breeding, so that we don't give up out of frustration. Since we're more engaged in the dragons and TT in general, we'll do more offers to get the scales, bulbs, etc. that we need to breed dragons. The hint would be helpful, but it would only be a hint. In other words, for somebody willing to put in the time and effort to complete the new treasure hunt, they'd get a bit of a bonus, but still have to figure out the second dragon on their own. That way, it wouldn't be a giveaway. If the powers that be like this idea, I'd also love to help develop the new treasure hunt. It could be really fun. I love this idea! I am quite new to dragon breeding. I guess I was quite lucky to find a Tier 2 dragon rather quickly. I am not sure what the odds are of finding a Tier 3 or Tier 4. I guess as you go up, the odds decrease. I would love the idea of a hint for this one. Mef, welcome back and thank you for your suggestion. It is indeed creative and we will factor it in when we find ourselves in the position of re-evaluating our dragon feature in Q1 of 2015. Appreciate the feedback! Always looking for ideas that are mutually beneficial. I love this idea, the thought of how many breeding pairs I have yet to try is very daunting. Even a small hint would be really helpful. How To Get Dragon Touches Fast. Is it worth it to start with Dragons? Poll How To Get Dragon Egg Touches Fast!